The iOS version will share the features found in other versions, including the Update Aquatic package for underwater STEM activities and the Chemistry Resource Pack. It will include a touch interface that is "functionally equivalent to the standard control scheme for the game," according to Microsoft, which owns Minecraft. At launch time, two features will not be available on iPad: Code Connection and Classroom Mode. However, according to Microsoft, those features will be coming soon. "Our goal is to always maintain feature-parity across Minecraft: Education Edition on all platforms; however, we occasionally make trade-offs in order to get new stuff in the hands of our customers more quickly." Licensing will be handled through the Microsoft Store, third-party resellers and volume licensing agreements. Delivery of the software will happen through the Apple App Store. An Office 365 for Education account is required for deployment. A free trial version will also be available for teachers (maximum of 25 logins) and students (maximum of 10 logins). The exact date of the iOS release has not yet been announced. A deployment guide and other iOS-specific resources are available on the Minecraft site. Teacher resources can be found here. In other news, Microsoft also announced that the consumer edition of Minecraft can now function in Education mode with the flip of a switch. By going to the Cheats menu and selecting "Education," users can access the Chemistry Resource Pack, previously available only in the Education Edition. This functionality is available for Windows 10 and Xbox. "Microsoft's education team is always looking for ways to help empower students and teachers, and Minecraft has proven to be a powerful way to teach skills today's students will need for future jobs," according to a Microsoft spokesperson. 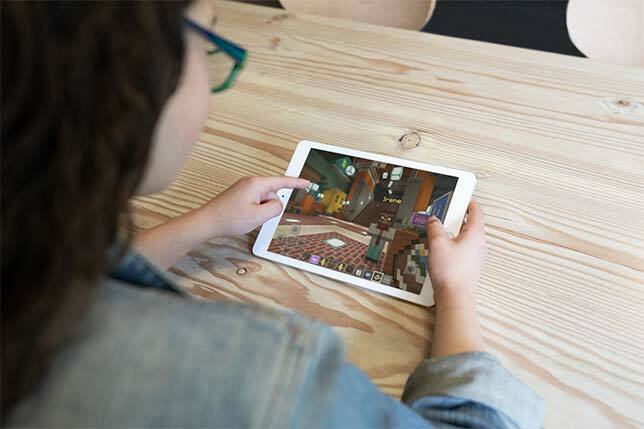 "With these updates, now educators and families are able to use Minecraft to engage students in STEM, inspire creative projects across subjects, and build important skills in collaboration, creativity and digital citizenship."